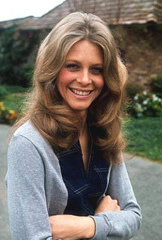 Performers include: Lindsay Wagner, Richard Anderson, Martin E. Brooks, Jennifer Darling, Ford Rainey, Sam Chew Jr., and Lee Majors. On The Six Million Dollar Man, tennis pro Jaime Sommers (Lyndsay Wagner) is involved in a tragic sky-diving accident. At the insistence of her boyfriend, Steve Austin (Lee Majors), her life is saved and she is given bionics. Jaime’s body rejects her new bionics and she is cryogenically frozen until doctors can find a way to repair a near fatal cerebral clot. When she’s finally revived, Jaime has lost her memories of loving Steve. On her own spin-off, Jaime poses as a schoolteacher who is secretly an agent for a branch of the CIA known as the Office of Scientific Intelligence (OSI). She works directly with OSI Director Oscar Goldman (Richard Anderson) and her bionics are kept in working order by Dr. Rudy Wells (Martin E. Brooks). Jaime’s bionic legs, right arm and right ear give her superhuman strength, speed and hearing which come in handy when she takes on powerful foes like the android Fembots and giant Bigfoot. Bionic Woman: Has the NBC Series Been Cancelled?